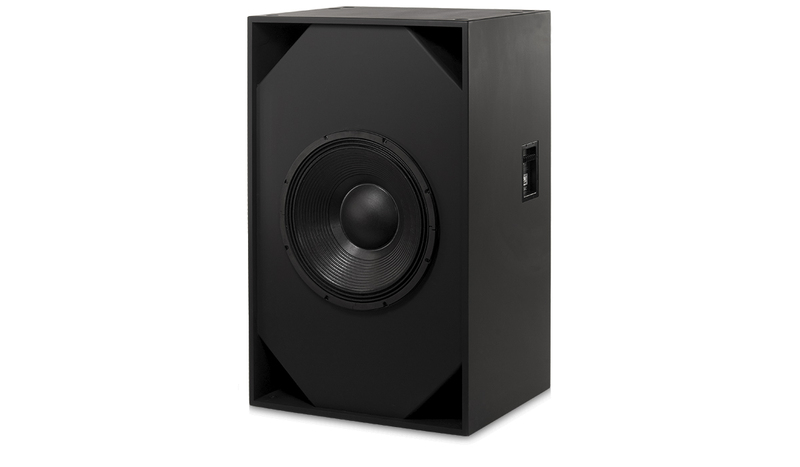 Read the SB-15121 application note : covers the target applications of the SB-15121, as well as advantages and comparisons to other cinema subwoofer designs. Transducers One 21" (533 mm) high efficiency subwoofer transducer featuring a vented 6" (153 mm) copper voice coil on a fiberglass former. High excursion/low distortion design, with extremely high power handling and low thermal and port compression. Neodymium magnet to provide a very high force factor and linear excursion. Connectors Barrier strip screw terminals accept up to #10 AWG stranded wire. Four terminals; two inputs and two parrallel outputs. Enclosure Vented enclosure with symmetrical port design, tuned to 25 Hz, constructed of medium density fibre-board and heavily braced. Features vandal resistant woofer mounting bolts.